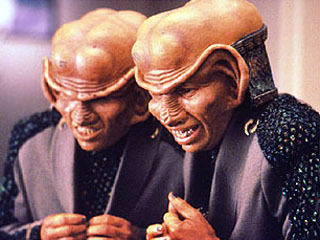 Ferengi are short humanoids with an enlarged skull divided into two visible lobes, and comparatively large ears. They have uneven, pointed teeth and a wide ridged nose. They were virtually unknown to the Federation until recent years, and still maintain their empire completely separate from them. Carver's sensor range, and at almost the same time a Ferengi vessel attacked the USS Stargazer. The attack was unprovoked and barely fended off with a unique maneuver by its captain, Jean-Luc Picard, now taught at Starfleet Academy as the "Picard Maneuver." Capt. Picard also had important early contact with the Ferengi Alliance as captain of the USS Enterprise. The Ferengi Alliance now trades freely with most worlds known to the Federation. The Ferengi Alliance is a patriarchal plutocracy, a government run by the wealthy where rank is determined by personal finances. Wealth and power are the same on Ferengal. The wealthy govern day to day operations and enforce Ferengi Law. Ferengi society is run by a social/religious leader known as the Grand Nagus. The first Grand Nagus wrote the Rules of Acquisition, upon which modern Ferengi Society is based. The job of each successive Grand Nagus is to interpret the Rules and make sure they are taught to each successive generation of Ferengi males (Ferengi females are not allowed to leave the home. wear clothes. or earn profit -they are often bought and sold as assets). Ferengal is a small, humid (swampy) world with a slightly thin atmosphere. It has never been visited by races other than the Ferengi. Most sentient beings in the Federation, Klingon, Romulan, and Cardassian territories are aware of the Ferengi's greedy nature and don't trust them. They are dealt with out of necessity. The Fornigi (as they are called in the Kilb-iverse) were only ever brought up once as Kae' Caballa and his then student (and Jedi Padawan) Drex Marr dealt with them during a boarder dispute near the planet Kling. As Kae' put it 'They think what's theirs is theirs and what's yours is theirs as well.' Drex just referred to them as 'Buttheaded' and both agreed that they had never had a more difficult time dealing with a group of people in all their lives. The Fornigi refuse to join the Republic and swear that one day the Republic will rue the day they interfered with their plans.